Village life for women is based on social interaction with each other. This is why we formed an association to achieve activities that each of us can’t do alone. Every Wednesday, all the members of our association gather to work. As we are now in the rainy season, many farmers need additional people to work on their farms because even with all their family members they do not have enough labour. Some of those people hire our association to work on their land. Most of the women in the village are members of the association. There are 30 members in total, and all of them work together when someone hires the association. If you hire us for one day, you will pay 1,500 CFA francs (close to US$3) to the association for each member working on the farm. When you just need us to work in your farm for half a day, you will pay half of this price. The money gathered by the association is important for its members. When someone needs money for an emergency she can rely on the association to give her credit. If you need a loan to run a small trade business you can also get credit from the association. But the money the association collects isn’t sufficient to cover the needs of all the women. I’d like to get a loan of 100,000 CFA (close to US$200) to make and sell food products but this is more than the association will lend. 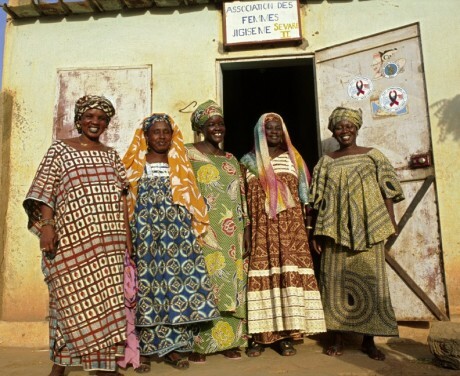 [Traditionally women cannot own or inherit land in Mali, despite being primary workers on the land, so they have no control over the farms proceeds. However, they can control the income from small-scale processing of agricultural products, provided they buy the raw materials rather than taking them from the family granary]. The association has decided that members can’t borrow more than 50,000 CFA (just under US$100). They created this policy to try to make sure that each woman has the chance to get a loan because all the members take part in the fund raising activities. Another reason to limit loans to 50,000 CFA is linked to risk. If the loan is high the borrower may find it hard to pay back the money. Another source of income for women is gardening [a garden being a plot of land for women to grow their own vegetables on]. A ‘project’ [locals use this word to indicate an NGO] advised the villagers to make a garden for the women. The chief of the village chose a plot near the village with the agreement of the owner of the land. Now in the rainy season the women’s garden isn’t producing very much. People concentrate on their farms, growing cereal and commercial crops such as peanut and cotton. But in the dry season we grow crops in the garden such as onions and lettuce. Now there are some plots of okra and potato, but generally the garden looks abandoned. Once the rainy season is over we will start working in the garden again as it is important to us. We can earn money from selling the vegetables we grow. However, there is only one well and it sometimes dries up months after the rainy season. Another problem is that the wire fence surrounding the garden doesn’t cover all its sides, and animals sometimes destroy the part that is protected by wooden fences. We benefit from many other advantages of the garden. For instance it also allows us to diversify what we eat. People say vegetables are very important for nutrition. Even if we can’t earn money from the garden we must take care of it because of its role in our nutrition.